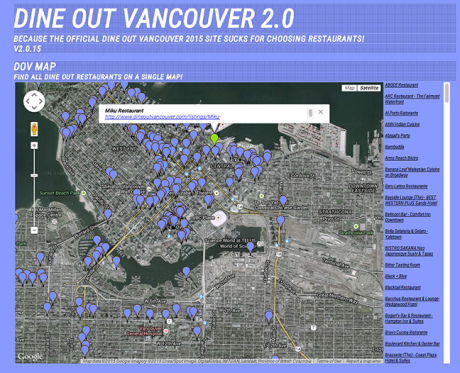 Last year I had created a restaurant tool for myself for Dine Out Vancouver, an annual food festival in Metro Vancouver. I was frustrated in choosing a restaurant to go to with my friends for the last few days of the event. I just wanted to see which restaurants were near the area where we were meeting and which were the top-rated restaurants to try. I was frustrated so much so, that I just went ahead and made my own search tools. So what I did was place all the restaurants on a map so the information could be browsed spatially, allowing one to pick a restaurant near them or a destination that they will be in. With over 250 restaurants, I also wanted to know which ones were good. So I cross referenced the restaurants with their Yelp scores and placed all the data in a dynamically sortable table, so people can sort the restaurants by the best score, most reviews, or other categories like neighbourhood and city. This year, I checked to see if the official site was any better, but to my disappointment it was exactly the same. So I just reused the same code from last year and recompiled the data with the new restaurants and updated Yelp information. That just took me an evening, which was mostly spent fixing erroneous Yelp or maps data. Last year's site saw about 500 views, I had only created it with 4 days left in the festival and sent it to just friends. This year, in the first 2 days of the festival it had 160 views. Over the course of the whole festival, the site received over 5300 views! DOV 2.0 was also picked up by the Vancouver Sun, which ran an article on it! I have received nothing but positive feedback from those who have seen it, and they really like it. They find it much easier to use than the official DOV site. Moderation is turned on for this blog. Your comment will require the administrators approval before it will be visible.